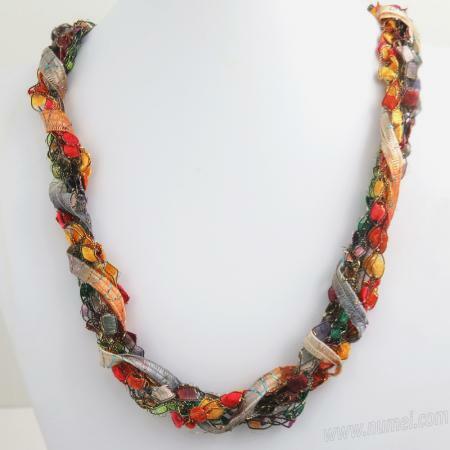 This ladder ribbon necklace pattern enables you to mix and match different ladder yarns and colors to produce a stylish, contemporary necklace that is totally unique to the colors of your choice. Make as many of these necklaces to match your wardrobe. To make the necklace, the strands are first crocheted, then twisted around each other to get a plethora of different color combinations. The strands are then wrapped with a flat ribbon yarn like Memento Royale, Tinkerbella, Memento or Racetrack to complete the look. 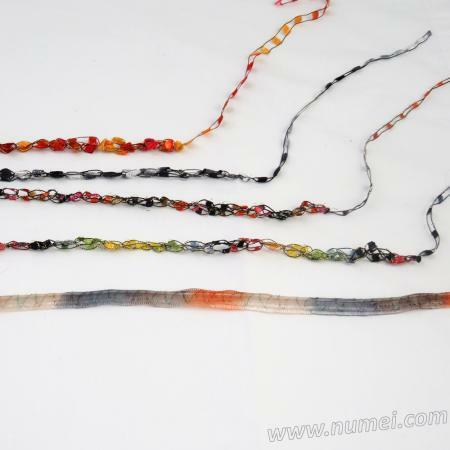 These necklaces are lightweight and really pretty yet inexpensive and easy to make. They are great for travel and safe for kids. They also make great gifts. US SizeK10.5 (6.5 mm) crochet hook for crocheting Ladder Ribbon and Ladder Ribbon Glitter. US Size M13 (9 mm) for crocheting East Track II and Ladder Ribbon Maxi. In this pattern, 4 crocheted ladder ribbon strands and 1 flat ribbon are used. 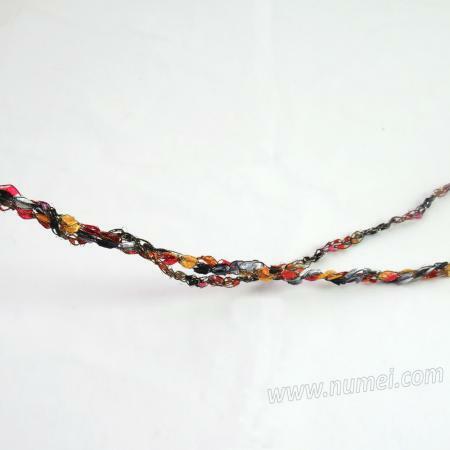 You may vary the thickness of the necklace by varying the number of crocheted strands used. Ideally, a minimum of 3-4 strands should be used. Make 1st strand - make a slip knot about 6" from the beginning of the yarn, chain stitch till crocheted section measures 24". Bind off and cut, leaving a tail of about 6". Make 3 more strands like the first strand but with each subsequent crocheted section 2" longer, ie. Strand 2 crocheted section should be about 26", Strand 3 crocheted section - 28" and Strand 4 crocheted section - 30". Now cut a piece of the flat ribbon about 2" longer than the last strand and set aside. Line up the knots at the beginning of Strand 1 and 2; wind Strand 2 clockwise around Strand 1 until you reach the end and line up the knots at the end. Place a heavy object on top of both ends to prevent them from untwisting. With Strand 3, wind around previously twisted strands in an anti-clockwise direction. Place the heavy object on top of the 3 ends. With Strand 4, wind around previously twisted strands in a clockwise direction. Place the heavy object on top of the 4 ends. Now with the flat ribbon, line up with the twisted strands and make an overhand knot about 6" from the beginning of all strands. Working in an anti-clockwise direction (ie. in the opposite direction in which Strand 4 was worked), wrap the flat ribbon around all the strands, being careful not to pull too tightly. You may vary the distance between wraps. Once you reach the end, tug lightly to even out the tension and make an overhand knot at the end. 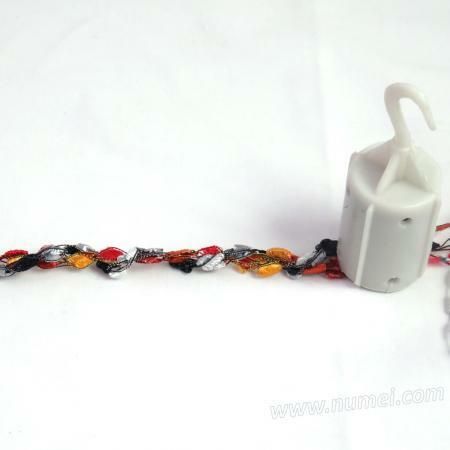 Take both ends together and make an overhand knot to complete the necklace. Trim off excess lengths at the ends. Copyright 2018 NuMei - This pattern may be used for non-commercial personal or guild use. Reproduction in print in any publication or electronic/digital format without permission is strictly prohibited.